Mashed Potatoes: Should You Peel Your Potatoes? 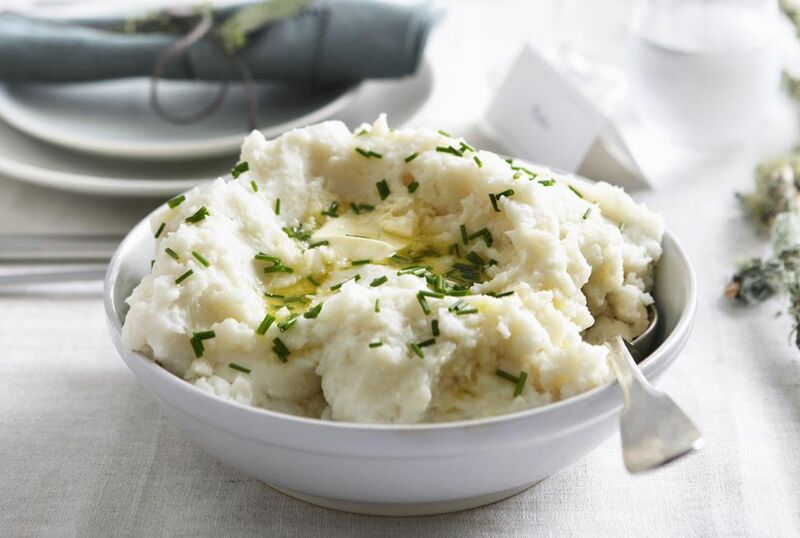 Mashed potatoes regularly appear on many American dinner tables. They accompany the steak, chicken, and sometimes fish—they even star on Thanksgiving menus. From the type of potato to the accompanying fixings, most home cooks have their own twist on the basic recipe. Many chefs recommend removing the skin before you mash potatoes, producing a fluffier, creamy mash. But skin-on recipes do exist, and aficionados prefer the more rustic result. So here's the short answer to the perennial potato question: whatever you like. The skin of a potato contains many vitamins and minerals, plus fiber and iron. High in vitamins C and B6, which help aid the immune system, skin-on mashed potatoes over Thanksgiving could help fight off the holiday sniffles. The peels also add a toothsome texture and an earthy flavor to the dish. Leaving the peel intact reduces the amount of prep and can even stretch the portions. If you do opt for the peels, be sure to scrub the potatoes thoroughly before you put them into the pot. Mashed potatoes may be a homegrown dish, but good restaurant chefs can elevate them to a star-worthy experience. Most peel the potatoes in pursuit of the fluffiest, creamiest cloud of buttery goodness. Most generally agree that starchy potatoes such as russets and Yukon Golds make the best mashed potatoes, but those varieties also tend to have the thickest skins, so if you belong to the skin-on camp, you might want to try a thin-skinned variety. Starchy potatoes, with their flaky texture, mash the best and also absorb the cream and melted butter, making them the preferred variety for a classic mashed potato side dish. You can eat the skin of any potato you choose but the peel on a russet may be tougher to chew. If you want the peel in your dish, opt for a Yukon Gold instead, which checks off the high-starch requirement but with a slightly more tender skin. Or combine peeled russets with unpeeled Yukon Golds for the best qualities of both. The thin skin of new potatoes makes them easy to eat, but the high moisture content can lead to gummy mashers. If you decide to use a new potato for your mashed potatoes, choose the smallest ones you can find, then boil them whole to reduce the amount of water they absorb. Mash them gently with a potato masher or a fork. A red-skinned potato makes a better choice for skin-on mashed potatoes. The slightly higher starch content compensates somewhat for the slightly tougher skin. Waxy potatoes such as reds retain their shape, so cook them until they turn tender and start to fall apart. For an exotic take on this homey favorite, use Peruvian purple potatoes. They resemble the Yukon Golds in composition but provide an unusual color for added visual interest. With any variety of potato, you want to mash them with the least amount of force possible. Use a potato ricer, a food mill, or a potato masher for the best result. Are You Choosing the Best Cut of Beef for Your Steak? Can You Trust a Product's Label When It Says It Is "Raw'? What is Solanine and Why Does it Turn Potatoes Green? Should You Be Soaking Your Bamboo Skewers?